Venus flytraps, like the rat-eating carnivorous plant featured in issue two, tend to grow in boggy soil that’s low in nutrients, hence they need to find another source of food to sustain them, namely insects that happen to land on their leaves. 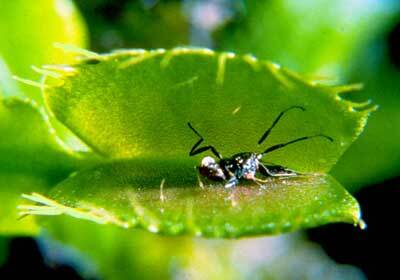 These leaves are about eight to 15cm long and are ‘hinged’ along the midline with spiny teeth around the edges. The folding and trapping action is triggered by pressure on six sensitive hairs which, when stimulated will snap the leaf shut in about half a second, although the actual nature of the action is still debated. As well as these sensitive hairs, the leaf also has glands on its surface that secrete a sap which digests the insect’s body. This process takes about ten days, after which the leaf reopens. Previous story Why don’t mobile phones get viruses?